The 2008 Drum Corps International Tour was to culminate with the World Championships in the brand new Lucas Oil Stadium in Indianapolis, but construction delays sent the contests down the road to Indiana University's Memorial Stadium, where the weather was picture perfect. No one who was there could ever forget Phantom Regiment's victory margin of 0.025 over the Blue Devils after Regiment had passed the Cavaliers in the Semifinals for the first time all season. In fact, the Semifinals was the first time all season that Cavaliers had placed lower than 2nd place. Regiment's late season surge was all the more remarkable considering that in early July, the corps lost to Santa Clara Vanguard, who finished 7th in Bloomington. In mid-July, Carolina Crown beat the Cadets for the first time in history, and Blue Stars popped into 8th place after not placing in the World Class Finals since 1979. 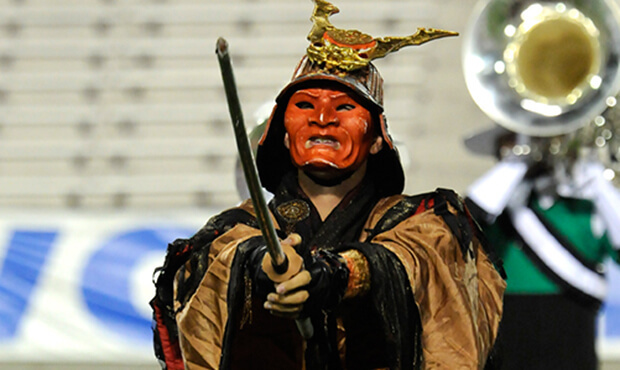 Celebrating the corps' 60th anniversary in 2008, the Cavaliers' third-place "Samurai" production was a show of original music in four movements, composed Richard Saucedo, Jim Casella, and Eric Johnson. The production honored the fearless and rigorously disciplined "Knights of Medieval Japan" and their noble culture of honor, courage and discipline. Exotic scoring in the front ensemble enhanced the ancient Japanese mysticism. Part of this was due to the use of a Chinese Yanquin, an instrument played with bamboo hammers that is somewhat related to an Appalachian hammered dulcimer. The corps' visual program in 2008 featured a return to the type of geometric drill evolutions that were the hallmark of the Cavaliers from the late 1980s through the 1990s. The drill required an impressive display of athleticism that showed off the horn line's intensive physical conditioning program. "Samurai" commenced with "Bushido: The Way of the Warrior," about the code of conduct governing a life wracked with intense violence, but tempered by wisdom and serenity. The Japanese word is a modern creation for what is comparable to chivalry, the European word describing a combination of characteristics such as gallantry, loyalty and an undying eagerness to protect those who couldn't protect themselves. The color guard members were dressed in stylized samurai costumes with ceremonial "rising sun" headbands. The rhythmic beating of a large Japanese taiko drum and assorted wooden sound effects backed the opening horn solo, followed by a loud fanfare that visually featured two samurai masters battling each other with swords. The victor appeared to decapitate the loser as long red banners were tossed into the air, unmistakable in their representation. Ceremonial taiko drums in the front ensemble played a recurring role throughout the piece. "Ronin: Masterless Samurai" demonstrated the intense loneliness of those who either had to live in isolation after the loss of their master, or who had the misfortune of falling out of their master's favor. The samurai code meant that those samurai who found themselves without a master had to commit ritual suicide called seppuku. If a samurai chose not to end his life in such a manner, he was ostracized by the other samurai and considered an outcast. The piece started with a slide whistle creating an Oriental flute effect and unusual brass techniques that further contributed to the ethereal exoticism. Brass players used their lips to bend the pitch of certain notes, intentionally creating sounds that normally would be considered out-of-tune. The work was intense, but full of angst. Toward the end, two lines of horn players wove in and out of each other after being displaced by a moving circle of tubas, amidst a return of the slide whistle, the wooden pit sounds and a series of pings from small gongs. "Ken-jutsu: The Art of the Sword" was a military art form known for its impressive movements and strategies designed to overwhelm one's opponents. In contemporary parlance, this is typically referred to as "kendo, the way of the sword" which is practiced with swords of bamboo. The word "art" referred to the technique the samurai used in practicing their swordsmanship. This movement opened with the famous Cavaliers' squiggling "dragon" maneuver performed in 1986 and 1987, an homage from drill writer Michael Gaines to his teacher, the late Steve Brubaker. The color guard utilized long poles as if training for battle. Half the horn line members knelt down as the other half leapt over their backs. Throughout, the drums pulsated vigorously. "Fumeiyo yori shi wo: Death Before Dishonor" was the duty of all Samurai who committed a dishonorable act, demonstrated cowardice in battle or contributed to losing a battle or a castle fortress. A more literal interpretation is, "rather than dishonor, death." This was where seppuku was more often witnessed, and it was not a pleasant way to die, involving a ritual disembowelment. Sometimes, another samurai was charged with decapitating the samurai who had just committed the act, so that the act would somehow be more "humane," as the period of suffering was shortened. During the mournful opening, the horn line formed the Japanese kanji character for "samurai." The piece became increasingly faster and more frenetic, sections of the horn drill pushing into other sections as if a chain reaction. A zigzagging return of the horn jump-over was added late in the season, this time with two lines that jumped over two other lines. It was a dizzying display of athleticism that is almost too complex to comprehend without repeated viewing. The samurai master that slew the other master in the opener returned to slay a mellophone player. In slow motion, the horn line member bent backward until his hat touched the ground, while the sword passed over him. He then bounded to his feet and slew the master with his horn, brushing off his shoulder as if his act of flexibility and his rebound was no big deal. Samurais, after all, must maintain a demeanor of coolness at all times. For this week only, you can save on the DVD set that contains this complete Cavaliers performance, along with all finalists from the 2008 DCI World Championships. Discount DVD offer ends Monday, June 2.